I want to thank my friend and fabulous artist Kris Wiltse of Whidbey Island, Washington for passing the Around the World Blog baton to me. If you don't know her exquisite, multi-facted body of work, please check it out. You will be so happy you did. Here's how this works. A blogger answers four questions and then invites another blogger to answer the questions on their own blogs the following Monday. Here are my questions and answers. I'm in the beginning, exploratory stages of paintings with mountain imagery as a point of departure. I've written about this recently so I won't repeat myself too much, I hope. The real subject of my work, and my reason for making it, is my deep response to the energy I feel everywhere around me. Call it the ch'i, the life force, the vibrations that, according to string theory, are the pulse and generator of the universe. I foresee for this year at some point and as a complement to my mountain paintings, a return to my first love in art, the human figure. Somehow, some way. I'm seeing, with my mind's eye, loose portrait-ish pieces made by drawing with paint, incorporating some cut and torn paper and some pattern elements. My recent illustration work using pattern and cut paper has fueled my imagination. I work in several ways, with different approaches, purposes, and different media. Maybe my pronounced mutability is a key difference, though the other artists I most admire are seekers like me and their work is always evolving and varied, too. I keep a deeply personal, introspective sketchbook journal in which I record ideas, images, as well as observations and facts. It is the wellspring for my work as well as a record of its progress. The work I care about emerges from this dialogue with my deep self. In terms of the physical making of my imagery, I feel more and more as if I'm becoming a kind of human divining rod. I approach a subject or idea with an open and inquisitive heart and I wait to feel the energy that I know is there. That process, when I'm lucky, gives me a gestalt, a sense of the basic gesture and forms involved. Looking at the examples I've included here, you will agree with me that they are nothing if not gestural! The materiality of my work gives me so much pleasure, too. Really, on some level, I paint and draw just so I can immerse myself in paint and ink and graphite, crayons and paper and gessobord. I have asked my brilliant and multi-talented friend Beth Adams of Montreal, Canada to follow me in this blog hop. Beth is a publisher, writer, editor, graphic designer, painter, and printmaker. Her blog The Cassandra Pages is worth a long, long visit. From an island in Washington state to a college town in Piedmont North Carolina to the major city of Québec...we're hopping! If 2014 were a road trip, I'd be dizzy from the speed and velocity of it! Whoosh! For the second year in a row, I've had a significant show of my work in the fall to work toward. 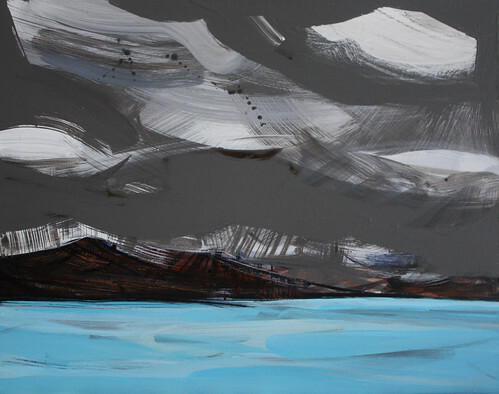 In 2013, it was my Iceland-inspired paintings at the Horace Williams House. This past fall, it was work on a floral theme at the Ackland Museum Store, UNC-Chapel Hill. They were two very different shows, the 2013 one featured all paintings, the 2014 show included ink and wash and mixed media on paper pieces, among others. And the pieces were too big to be scanned and I didn't have time to take good photos of them... whoosh! Having deadlines is a powerful motivation, but I learned from these two shows not to say yes to another show unless I have over half the pieces already finished when I agree to show! (Yikes! and pass the ibuprofen!) Still, the show went really well and I loved working with my fellow exhibitor and friend Ippy Patterson and my buddies at the Ackland Museum Store. 2014 brought more illustration work for me, including images for Walter Magazine, Charleston Style & Design and Chapel Hill Magazine. Other clients this year were The Nature Conservancy and Edible Hudson Valley. Fireflies for Charleston Style & Design. Person Street illustrations for Walter Magazine. Blue crabs for Edible Hudson Valley. I travelled a lot in 2014, but since this is already sounding like one of those annoying Christmas letters, I'll mention only the trip that relates directly to my art career, my October trip to Italy. I had the great fortune to have been invited to Rimini, Italy for a conference organized by the Italian tourism industry, one designed to connect people whose passion is travel with people whose business is travel, to see what kind of synergy might result. My years of travel writing and sketching on my blog led to my being chosen to participate in this exciting new conference, now in its second year. It was exciting, fascinating, informative and fun. I learned so much about the travel industry and about the power of social media and about what it is I do as a blogger and why I do it. I met many lovely people from all over the world. I will be forever grateful for the organizers of TBDI 2014 for having given me this opportunity. and they, along with my passion for the mountains of Norway and the rugged topography of Iceland, have filled me with ideas for new paintings... some kind of response, I know not yet what, to this mountain splendor and energy. More about this in my 2015: A Plan, to be published in the next couple of days. 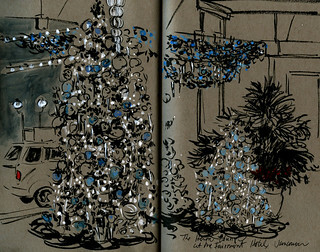 Finally, on December 20th, I led a sketching session at the Nasher Museum of Art at Duke University. This was a kind of reaching out and giving back as an artist that I have done very little of, but I so enjoyed that I am eager to do more, more, more! I had a fabulous group of sketchers, almost all beginners, and they reported having benefited a lot from my talk and our working together. It was such fun and very rewarding! So, I think that covers it... though I can't be sure, dizzy as I still am from all the 2014 action! I have many thoughts about what is to come and will share those, as I said, in the next few days. Happy 2015 to you, dear readers. I hope 2014 has been kind to you. Thank you for sharing this journey, many of you, year after year. I am so very grateful for your interest and support. I am now so thoroughly in love with Italy that I'm superstitious about using such words. I will be back. Italy calls me. Still, here we are... for now. A few representative sketches from my last, my final days ON THIS TRIP. 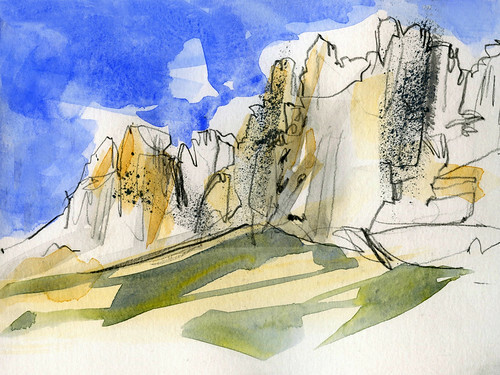 How, again, to render the Dolomites in a small sketchbook? It's a tough one. Here's the best I could do... just the energy, lines, subtle colors, and basic textures. Here is the double spread from that day in the Dolomites. I have Photoshopped out the big wire rings from my sketchbook and joined the two pages as best I could. Can you believe this...those jagged peaks were once coral reefs at the bottom of a sea! This was in the Miocene epoch, 20+ million years ago. I remember it as though it were yesterday. My friends and I spent one glorious night in a hotel above Cortina. At the bar we drank our favorite aperitifs and I caught a moment on paper of the mother of the family who runs the place. She was looking a bit tired after a long day of dealing with guests. I miss Penelope and Michael, and I miss Italy. I'll be back sooner rather than later, that I promise. 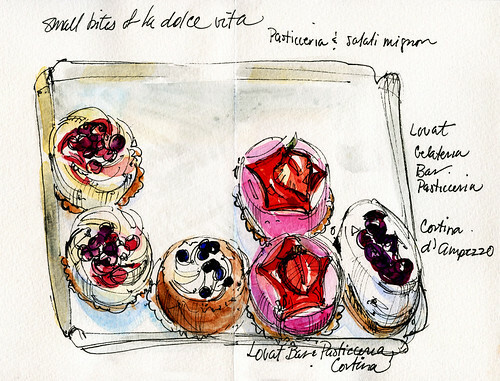 Italy sketches, first batch: TBDI 2014 conference and more! At the wonderful TBD Italy conference in Rimini week before last, I had little time to sketch! Our days were busy from 8am to bedtime! But I managed a few drawings, mostly made during talks, and here they are. Backs of heads, fronts of heads, people sitting, earnest speakers making important points and opining! You can see I ended up using mostly pen and wash at the conference. One brush pen sketch I made was a bust, so I ditched it for the rest of the trip. I was busy and I had to make each sketching minute count! 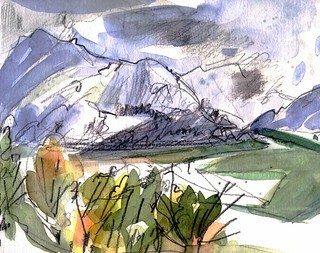 I have more sketches from the second part of the trip... mountains and food, mostly. To try to capture the magnificence of the majestic Dolomite mountains in a tiny 4" x 6" sketchbook was daunting, to say the least. More about this next time and more sketches, too. Here's a sample, though. 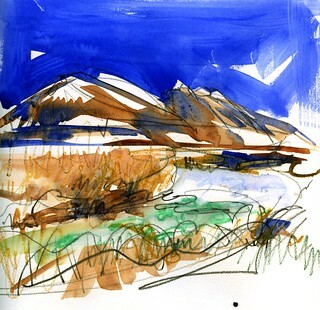 Quick and loose, Cretacolor oil pencil and wash: the view above Vipiteno, the northernmost town in Italy. I fell in love, love, love with the Italian Alps. They brought back beautiful memories of childhood trips to the Swiss and French Alps... they are the same and they are very different. Ahhh. I am deeply grateful to the organizers and sponsors of TBD Italy 2104 for hosting me! I met so many charming people who are now new friends and I learned so much about the travel industry in Italy and beyond. I became clearer about what it is I do as a blogger and why. It was a priceless experience in very many ways. It's the eternal question for us traveling artists. Which art supplies to take? On my upcoming trip to Italy to attend the TBDI 2014, I'll be taking only a carry-on bag, so the lack of space makes the question even more agonizing. I am usually a quick decider, but on this question, I waffle with the worst of them. The truth of this hit me hard recently as I was choosing some of my sketches to be published in Cathy Johnson's upcoming book, provisionally titled, "Sketching on the Spot.' The first decision, then as now, boiled down to which would be the default sketching tool: pens or pencils? I most often sketch with pens, such as my Pentel Pocket brush pen, which feels like an extension of my fingertips. Being a painter, I love the brushiness of those lines. They do robust, they do atmospheric, they play well with color or on their own. But lately, my heart is leading me back to pencil, that most sensuous of drawing tools. There is NOTHING like the skidmarks, the fractured trails of a big, fat, soft pencil on good paper. With or without color added. And then there is the matter of the which and the how of taking watercolors! I think this time, I'll take a few squeezed-out blobs from my paint tubes in a very lightweight plastic travel palette. So here's the plan for now: two pens (one brush pen, one hard tip), a couple of pencils, limited watercolors and, if I have space, 4 or 5 watercolor crayons. And did I mention which sketchbook to take? I did not. That's a thought, alas, for another day. My decider synapses, now exhausted, have taken to their beds. I grabbed an hour today from more pressing deadlines to process/scan these sketches. It is still May and I am still thinking about Italy! I have a few more besides this crop to share, too. When? We shall see. It's back to the big stuff for me for the foreseeable future. Venice is many things. One of them, often, is pink. The lanterns around St. Mark's square have rosy glass in them. And some of the marble in the Doge's Palace is pink, too. I love this pinkness of Venice. Venice is also very decorated. This I love, too. And the sculpted forms, the capitals of columns especially, are lively, charming, and surprising. Check out the fish heads adorning the capitals in the Rialto fish market sketch in the last post. Check out the herons on the capital here, atop a column of the Doge's Palace. Okay, so it's not just Venice that is pink. Here is the main square in my favorite hilltown of the Veneto--- Montagnana. It, you will see, is pink. I made it pinker than it is, but that is what art is for. And now back to Venice again, with the two last sketches. One is of gondolas. You know I had to. And they are not pink. The rich darkness of Saint Roch's Church is populated with, in addition to magnificent Tiepolo and other Italian master paintings, giant lanterns and fanciful figures atop pilasters in the Grand Hall. Back to painting and illustrating. I should, I HAVE TO, be through with the latter in a few days, so I will come back and report. Ciao! Yes, dear friends, it's life in the Cuisinart lane again, so many projects rocking and rolling, deadlines looming, ideas popping left and right----all very exciting. And stressful. But mostly in a goodish way. 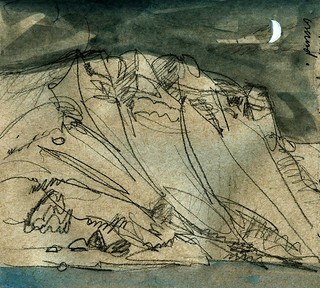 So, here, in between major items on the To Do list, comes the first batch of Italy sketches. We had a memorable, lovely time. Italy is... Italy. I've fallen, hard. Italy being Italy, as we've agreed it is, eating is a popular pastime. And, never ones to wish to be contrary, we did eat. The two sketches below are the left and right sides of a single spread, made in my beautiful Cathy Johnson sketchbook filled with a variety of paper types. 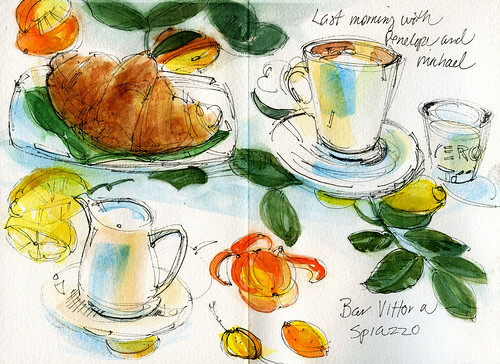 And the sketches above show a similar spread, made at the Venice Fish Market. The color is off in the last image. I took an Iphone photo of it to show you how it works in the book itself. Here are the Hotel Cipriani ones in that same format. I'm having a terrible time formatting this post. My apologies for how clunky it is! Finally, a sketch of one of the many lions of Venice. I love the rugged and robust air they give that beautiful, otherwise ethereal, city. PS I had a great time using the colored pens I took (see previous post!) 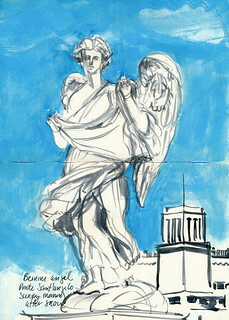 I have more sketches and will process and scan them in stolen moments from my big jobs. Ciao, buddies! News from the traveling artist! Leaving for northern Italy soon and, except for my hideous head cold, I'm in pretty good shape! Thought you might like to see my art gear selected for this trip. The *palette is considerably warmer and more diverse than the ones I took to Iceland and Norway in the winter! Note the gorgeous sketchbook pictured, covered in burnt sienna and gold and umber paper. That is a handmade journal given to me by my dear friend Cathy Johnson. I have had it for a while and have been waiting for just the right time to break it open. I think a trip to the Veneto qualifies as just the right time, don't you? I won't fill it all this trip, so I guess I'll just have to plan another Italian trip next year. Too bad ;D.
I'm taking two sets of colored markers/pens, something I've never done before. I want to have access to color without having to depend solely on watercolor washes for it. (There is often not enough time to paint on site when I'm traveling with others and I'm impatient, anyway.) I've got chisel tip Prismacolor markers, chosen because you can get such varying line weights with them, and colored Sakura brush pens, too. I have a cartridge pen filled with Noodler's Lexington Grey ink and my trusty Pentel Pocket brush pen. I have two nero Cretacolor oil pencils and one in sanguine. Also, a Stillman&Birn landscape Alpha sketchbook and portable watercolor brushes, etc. *Here are my (completely quirky and not very rational) palette colors: Daniel Smith transparent Pyrrol orange, DS quin rose, DS graphite gray, DS new gamboge, DS transparent yellow oxide, DS quin gold, Holbein ochre, DS terre verte, DS ultra turquoise, DS manganese blue, DS cobalt blue, Winsor Newton cobalt turquoise light, DS lunar blue. I don't need all those yellows, but Wendy Shortland, an artist friend now traveling through Italy, suggested I bring the yellow oxide. It's different enough from my the Quin Gold and the ochre, so I added it. The palette weighs about as much as two feathers, so it's okay to have so much. So, the Italy trip is to come. Here's an interview I did last week, based on some previous trips, for a fabulous new website called Wander Arti that combines two of my greatest loves: art and travel. The questions about travel and about artistic style are interesting, so have a look. And leave a comment, if you like. I'm sure Lizzie Davey, the site's founder, would love to have your feedback. See you soon, on the other side of the ocean! 2012 was important... and busy! This has been a significant year. I've worked on several fronts, most art-related but not all directly involved with the making of art. It all began on January 2nd. A friend I saw at a party urged me to apply for a show at a great local venue. I was between galleries and so I thought, "Why not?" In February, I made an illustration for The Morning News and fell hard for volcanoes as subject matter. 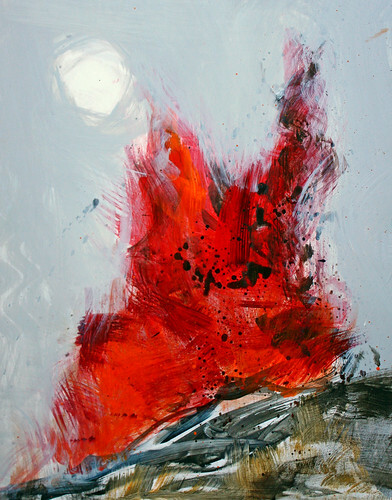 I carried on with volcanoes as images for paintings and started a painting series as part of my application for a solo show. So now, I'll be having a show fall of 2013! I'm a slow painter, so I'll need all that time to get the paintings done. I had some illustration jobs to do, small and large. In addition to the volcano one for the Morning News, above, I designed the logo for a new literary prize that is launching in a few days. My friend Maxine Mills, a brilliant graphic designer, tweaked and fine-tuned. My reading pig looks very polished now, don't you think? I illustrated the second edition of a local foodlovers' guide. 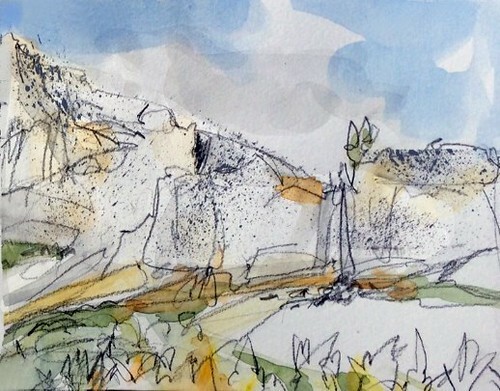 I curated the first group exhibition of Urban Sketchers, a brilliant idea proposed by Alice Southwick of the Ackland Museum Store in Chapel Hill, NC! My fellow Urban Sketcher correspondents were so generous in donating their work to this successful fundraising show. I traveled a LOT in 2012. 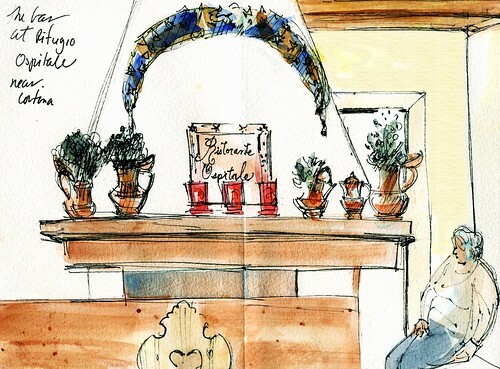 First was Rome in February to see two of our children and to sketch with Concetta Flore! In late June, it was back to Italy again, this time for the wedding of a dear, old friend's son. In October, compelled to visit the land of volcanoes again, my husband and I went back to Iceland. Then, in early December, it as off to Vancouver for a brief celebration of our 21st wedding anniversary! Putting it all together like this, I'm overwhelmed with gratitude for what WAS, clearly, a very important year. I'm reenergized and I'm ready to begin again! I thank you for sticking with me through a year of infrequent blog posts. Life, the blogging world, change...and we change with them. I'll be back with more in 2013! Happy New Year to every single one of you! Many of you know I'm an Urban Sketcher correspondent. For the last few months, I've helped organize and mount the first ever group show of this international organization. 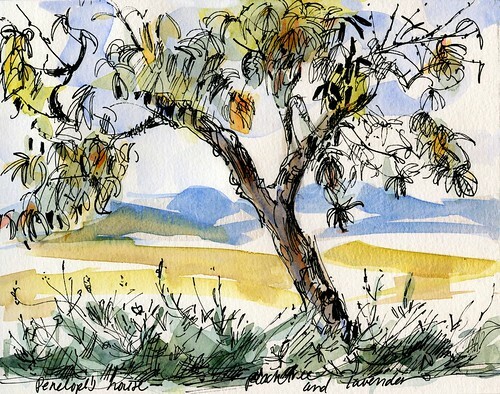 I have posted about it on Facebook and on the Urban Sketchers' blog, but not here. I thought it might be nice for you to see one of the things I did on my summer vacation ;D.
Here is nice coverage of our show by Blue Greenberg, longtime art critic at the Durham Herald-Sun! 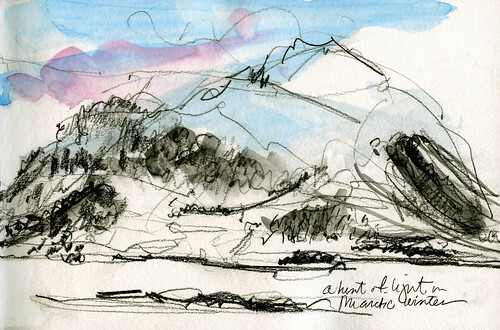 “Seeing the World, One Drawing at a Time: Urban Sketchers,” Ackland Museum Store, corner of Columbia and Franklin streets, Chapel Hill, through Oct. 6. Store hours are Mondays through Wednesdays, 10 a.m. to 5:30 p.m.; Thursdays, 10 a.m. to 8:30 p.m.; Fridays and Saturdays, 10 a.m. to 5:30 p.m.; and Sundays, noon to 5 p.m.
On Franklin Street at the Ackland store, there is a lively exhibition of sketches made by professional artists on their trips around the world. They are an active group called Urban Sketchers and, through the magic of the Internet, they have come together to show the things they see in their own cities and places they visit. These are quick, made “in the moment” and the degree of finish varies. Some are carefully drawn, like Eduardo Bajzek’s “Bass Player,” and we feel the warm wood surface of the instrument. Others are like Greg Betza’s quick lines that crisscross into a city plaza, with people and buildings and streets intersecting in the background. Bajzek does architectural illustration and is from Sao Paulo, Brazil. Betza is an illustrator, artist and designer and lives in New Jersey. It has to be such a joyful gift to be able to sit in a place, take a pen, pencil or brush and a piece of paper and put down what you see. It is a practice of patience, so much more satisfying than taking a photograph. Even if the time spent is minutes, the hand and eye bring the scene to the brain and it is there long after the moment has passed. “Drawing a city isn't just capturing it on paper, it's really about getting to know it, to feel it, to make it your own," writes Nina Johansson, a Stockholm correspondent. Urban Sketchers are professional architects, graphic designers, illustrators, educators and traditional painters who live in and travel to cities such as London, Sao Paulo, New York, San Francisco, Chapel Hill, Singapore and Seoul. Their mission is to encourage the artistic and educational value of location drawing and to show others the world, one drawing at the time. The Chapel Hill exhibition showcases 90 art works by 38 of the group’s international contributors. 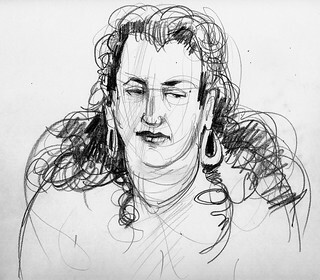 Spanish-born Gabriel Campanario, who now lives in the United States, and is a staff artist for the Seattle Times, organized the group, first as flickr in 2007 and then as the nonprofit Urban Sketchers in 2009. Blue Greenberg’s column appears each week in Entertainment and More. She can be reached at blueg@bellsouth.net or by writing her in c/o The Herald-Sun, P.O. Box 2092, Durham, NC 27702.